Description: The occasional weird looking dog gets a trail camera shot of it, or a blob washes up on the Puerto Rican coast and the locals point to it as a sign of the impending apocalypse. Just be glad the truth is a little stranger. The Goat Sucker, dubbed El Chupacabra by the locals, is the size of a large dog, completely lacking fur or other similar coverage on its skin. As far as retrieved (dead) specimens go, the largest found measured 20 lb four days into decomposition, measuring in at about a yard long from head to tail splayed out on its side. Our field biologists and several contracted Bahaman veterinarians can agree that the species lack sweat glands or follicles, but are assumed to be Marsupialian from pouches observed on both sexes of specimens. 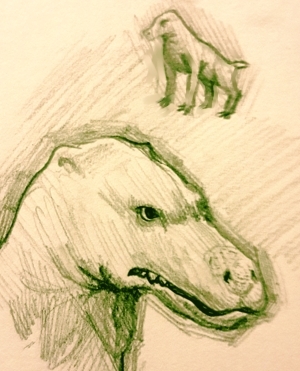 Goat Suckers are possibly descended from a continued direct line of early Therapsids, appearing vaguely mammalian with several reptilian facial features. Goat Suckers need to eat like any other animal, but contrary to local "vampiric" descriptions, they do scavenge from carcasses. On occasion, they will seek out small prey to devour and even supplement their diet with fruits or wild berries. Blood is a nutritious treat to be consumed by the Goat Sucker and it won't shy away. These organisms definitely aren't accepted by mainstream science as they harbor a strange ability: Evolutionary Mimicry. Vampire Dogs are extremely adaptive, able to incorporate their meals' DNA into their own and temporarily acquire these traits. Most famous reports (see Shell Dog Encounter Report in the Records section) indicate a preference for armadillo carcasses or armadillos for their defensive capabilities. Armadillo-Chupacabras appear similar to their basic form, though their skin has grown a hardened segmented carapace where floppy skin would normally go. Other similar acquisitions are gliding wings from fruit bats, immense jaw strength from snapping turtles, and opposable thumbs from howler monkeys (much to my dismay). The forms they turn into are temporary, passing through their bodies after a week of consumption. However, the more of the same animal they eat, the longer they can stay in that evolved state. Plants and fruits don't seem to have any effect on them. Despite some knowledge of their abilities, our Central American Security Team (CAST)1 is at work creating exclusion zones to keep them away from communities. We still don't know what happens when they eat human flesh and we want to make sure we don't find out. Background: The Cold War was hotter than you remember. The Bay of Pigs in '61 could have started something big at the time. Compounded with the fact that the Soviets moved missiles into Cuba in '62, we were reaching a boiling point. The silos the Cuban and Soviet engineers built were capable of launching medium-range ballistic missiles tipped with nuclear warheads. While human ingenuity allowed for these awe-inspiring weapons to exist, it also caused some problems. A CAST raid of old documents thought to be destroyed decades ago revealed that there was leakage of radioactive materials during transportation of the missiles. Of course, the leakage was immediately contained after it was noticed, but the damage to the environment was difficult to measure, even more so with government suppression. 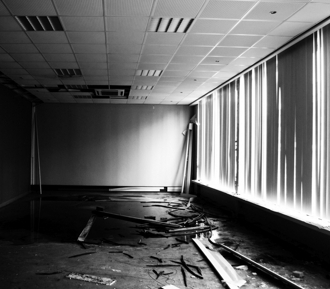 Inside a building labelled "Department 4, Seismological Research" at the former launch site. A localized expedition by for-hire Cuban allies was sent out into the countryside near San Cristobal in 1991 to collect dirt samples for the purpose of radiological testing. At the time, we were investigating reports of a creature that propped up along Florida's coasts and we assumed that the rip currents may have brought it in from Cuba. The expedition revealed a swathe of residual radiation within a closed off "conservation zone." Cuban ecologists weren't blind to the environmental effects and abandoned research labs were discovered along San Cristobal's former silo grounds, though they were dilapidated. Uncovering the research notes of a Dr. Manuel Tercero within the ruins of the site showed us contextualization of how the Chupacabra came to be. The following message was found within an unmarked manila folder, addressed to a Ms. Rivera. Its original text was written in Spanish, which has been translated into English. + Message to Ms. Rivera, dated July 11th, 1989. - Message to Ms. Rivera, dated July 11th, 1989. Urgent Message to be sent to Ms. Rivera, Department 2, Ecological Research Building. Internal. Its cell structure is similar to any other organisms within the animal kingdom. In fact, its DNA shows it is related to most mammals. The exhibition of a pouch located in the ventral torso leads me to believe it is related to Marsupials. There is something marvelous about the process of DNA replication that its cells undergo. Its nuclease enzyme is dissimilar to almost all animals' in function, as they do not break apart the DNA strands that it digests! This special biochemical structure, which I will refer to as Nuclease X until we can determine its composition, instead reserves and propagates the strands to be replicated later on during the normal DNA replication process. It replicates and expresses this code and even adapts to the phenotype of the genetic code, specific to the DNA of whatever it has consumed. Our specimen in captivity can be observed with the wings and a snout similar to bats of the Pteropodidae family (since we had fed it fruit bats). This information may be pertinent to the advancement of our understanding of genetic material in the future. I believe that the expression of this animal's Nuclease X enzyme has been mutated by the radiation that various animals in the area were exposed to decades ago. Unfortunately, because we lack the facilities here, I was hoping you could contact our friend in the Bahamas. No more records of Dr. Tercero have been found and we still don't know his identity. It's as if he was scrubbed from the records that we had access to; looking for him is currently Team Bermuda's primary objective. Our animal doctors from the Bahamas were recommended to us by Bureau contacts. I suppose this is why we keep them at arm's length. Location and Population: It's not hard to imagine that they ate some fish or other marine animals to be able to spread around the Gulf of Mexico. Since our major discovery in 1991, we found other coastal and even inland reports flow in with major sightings occurring in our home turf of the Everglades. Sparky and I2 keep up the documentation in Florida and keep in frequent radio contact with CAST to spot any movement. Their population is not known, but they are assumed to number somewhere in the hundreds. Still not much, but enough to be seen. Because water travel is quite effective at spreading them around, it's dangerous for us if they leave the Gulf, though they haven't migrated to other areas beyond as far as we know. Seems they're comfortable living here. Hunting or Procurement Methods: La Quivira, one of the CAST outfits, employs fishermen to keep an eye out for sightings, but we've yet to capture one alive for long. There must not be enough of them to hunt for, but hell, those sightings pop up like moles in our backyard. The only specimens we've captured were dead or died relatively quickly in captivity. It requires pure luck to catch, even dead ones. We're still trying. Encounter Records: Though short, this report is our most well known since it is the only one in which our team encountered and captured live specimens before the creatures perished. It's not as glamorous as you thought it would be. It was submitted by the outfit, Gruquilo (Grupo Tranquilo, Quiet Group in English), operating in the Yucatan Peninsula. Location: Outside Campeche City, Campeche, Mexico. At approximately 1920 EST, our team encountered a pair of what we thought at first were abnormally large armadillos along the treeline southeast of Highway 180D during a patrol. After seeing their spindly limbs and skin, we deduced that these creatures were the reported Chupacabra because of the information we had been updated with from the Society. They were clearly starving and in some kind of transitory physical stage, as their body was rotting [Is this the right translation?] rapidly. Within 10 minutes of the encounter, we attempted to capture them using nets that easily subdued them. However, at 1945 EST, they began to breathe laboriously as we attempted to feed them beef. At 1956 EST, the pair went into shock from stress and half an hour later, the two had been confirmed dead by our field biologist. We then put the bodies on ice in our beer cooler within minutes. We noted that, by comparison to actual armadillos, the armor on the creatures were just as hard if not harder, save for where the joints were. I don't think most handgun rounds would be able to pierce it, but we didn't bother to test because we wanted to preserve them as best as possible. On ice, the carcasses were brought back to a taxidermist's freezer in Lázaro Cárdenas. What a shame. Additional Notes: The Bureau's ongoing funds for CAST ceased after 1990 (probably because they didn't need to monitor Cuba as much since then), so we've relied on volunteer work from local outfits. The Bureau did pay heftily for these carcasses though, and some outfits resorted to selling to them for funding, which I dislike, but what can you do? Our DCC in the Bahamas does have some remains in storage, but like the doctor, we don't have the facilities to really scrutinize them. We'd have to go to the Bureau for that, and I'm sure plenty of us don't want to hand over the only bodies we have left. Maybe over my dead body. 1. An affiliate organization to the Society based in Central America and the Carribean. Formed by various outfits operating in the region under the Central American Regional Council. Started in the '60s and currently operating. 2. A Warder with the alias Vulkan from Team Bermuda, the outfit that operates in the southernmost point of Florida.